Got Arachnophobia? 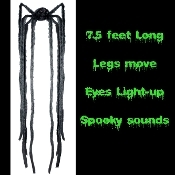 Creepy Animated Long Legged BLACK Spider with Moving Legs and spooky sounds. Hang from haunted house ceiling and watch the screams begin! This motion-activated ominous Black long arachnid is sure to create a fearful impression. When activated, the long legs move, eyes light up and spooky sounds are emitted. Giant hanging creepy crawly with 7.5-foot (228cm) long furry chenille legs will be the life of your Halloween costume party or haunted house as a centerpiece or entry display decoration. Requires 3-AA batteries, NOT included. *Please note that upon receiving product, there will be wires that need to be unraveled to let the other spider legs hang loose. Recommended for indoor or covered porch use only. Approx 9-inch wide x 4-inch deep x 91-inch Long (22.5x10x228cm).